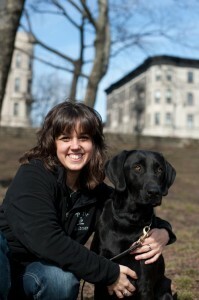 Sarah Westcott, CPDT-KSA is the owner of Doggie Academy and founder of the Brooklyn Dog Training Center. As a Certified Professional Dog Trainer, she offers obedience training and behavior counseling to New Yorkers and their dogs. In addition to private sessions, she teaches puppy, manners, behavior and agility group classes. Sarah officially launched Doggie Academy in 2007. She is a certified AKC Canine Good Citizen evaluator, a Mentor Trainer for CATCH Canine Trainers Academy, certified in Cat & Dog First Aid by the American Red Cross and a former trainer for The Good Dog Foundation, a non-profit organization dedicated to training and certifying dogs for animal assisted therapy. She has fostered dogs for the ASPCA’s Behavior Department, including a Pit mix named Hope featured on Animal Precinct. Her late Labrador, Charleston, was a Good Dog Foundation therapy dog and featured in catalogues and on Law & Order. Sarah is also an agility instructor at Camp Gone to the Dogs, a vacation camp in Vermont for people and their dogs. She believes that training should be fun for both dog and human and strives to be a positive influence on that relationship. She lives in Brooklyn and enjoys training and competing in dog agility with her Labrador Retriever, Hank. Together they have earned several titles in AKC and USDAA. Sarah & Hank were honored to be amongst the competitors at the very first Master’s Agility Championship at Westminster and were thrilled to win the 24″ Excellent Standard class!